Driving home yesterday evening over the hill, came across an unexpected sight, and one that at first glance threw me. Having spent much of the afternoon discussing poultry, I clearly had chickens on the mind, as my initial reaction was to wonder what the hell a bantam was doing walking down the road towards my car in the middle of a heather-covered moor. 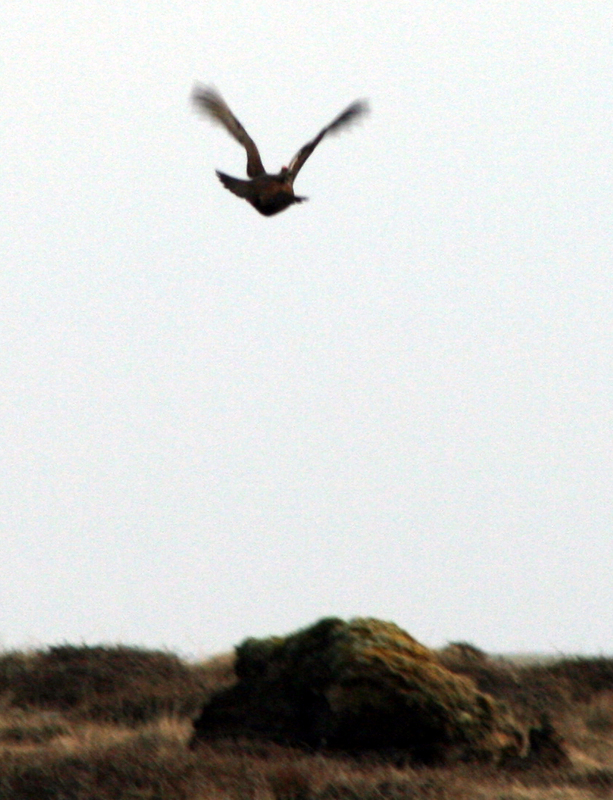 The bantam finally realised he was about to be splammo’d and flew off, closely followed by a hitherto unseen partner – a fine pair of Red Grouse. My first of the year on the isle, and only the second time I’ve seen them on my patch – they’re usually far more reliable at the other end of the island. Grabbed the camera from the passenger seat and managed to get a shoddy flight shot of the arse-end of the male as he zoomed away over the peat banks. Meanwhile today my nesting office Raven is spending all her time now on the nest, making only very occasional forays away from the pylon. (This morning to menace some discarded pizza in the office car park).